You spend a significant part of your day at your workplace. And though we all hope to never suffer any kind of injury during that time, it’s still best to be prepared. Ensuring that a first aid kit is on hand is the best way to do that, but simply having one isn’t enough. You need to know which type to choose, where to keep it, and how to keep it stocked. Here’s 4 first aid kit tips that’ll help you keep your workplace stocked and prepared. What federal or provincial/state regulations must you follow? How many employees work on-site at one time (or per shift)? What’s the location of your workplace? Is it in an area that’s difficult to access? What industry are you in? What are the potential hazards? How far are you from a medical facility? Once you’ve answered those questions, you’ll have a better idea of the type of first aid kit your workplace needs. Generally, the more employees you have, the more serious the potential injuries, and the farther you are from professional medical help, you’ll need larger first aid kits with more varied supplies. Take some time to think this through, and make your choice the right one. Though it’s unlikely you’ll have to time to read in-depth instructions during a first aid emergency, a first aid manual will help you and your employees be far more prepared. Encouraging co-workers to read and share the information inside will make everyone more confident in a potential crisis, and increase the chances that the right first aid decisions will be made. Simply having a manual nearby will remind everyone about first aid’s importance, and hopefully remind you to schedule proper first aid training for your entire team. The last thing you want in a first aid emergency is for no one to know where the first aid kit is kept. Even if it only takes a few extra seconds to hunt down a missing kit, that’s a few extra seconds not spent treating an injured person. So, the smartest thing you can do is put the first aid kit in one place and keep it there. Point out its location to each and every employee, and make sure everyone knows it’s not to leave that place until a first aid emergency happens. This will save several seconds during the opening moments of treatment, which can make all the difference in helping someone. Just make sure that once the emergency has passed, the first aid kit goes right back to its original resting place. 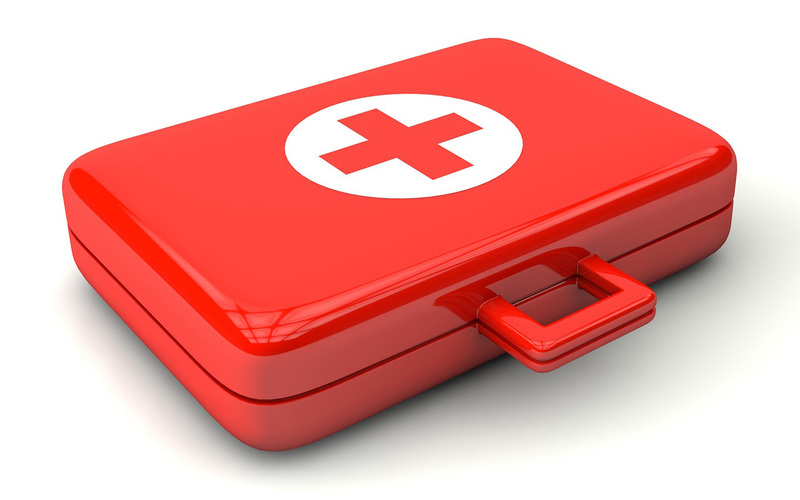 First aid kits come filled with the supplies you’ll need to treat and stabilize injuries. But, those supplies are finite, and it can be very easy to forget that. If you’re in the middle of treating an injury, only to discover you’re out of the supplies you need, you and the injured party may be in big trouble. You can make sure it never reaches that point by staying on top of checking your first aid supplies regularly. After every first aid emergency: make a list of everything used and replace it immediately. After every time change: make a list of everything that needs replenishing, and do that ASAP. First Aid is everyone’s responsibility. By using these first aid kit tips, you can ensure your workplace is properly prepared, and your entire team properly educated. Just remember, first aid is meant to help stabilize an injured person until they can reach proper medical help. In cases of serious injury, always call an ambulance or go to a hospital.